Today we have developed a few more approachable keg formats. For your convenience we offer all necessary taps and gear. Here's a manual to go along with it. Füchschen Altbier kegs have a new and efficient valve technology that is based on the original tap design. Kegs are available in 30, 20 and 10 liters. 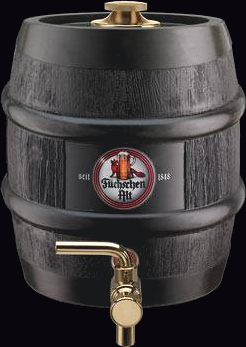 At Füchschen Altbier is traditionally served out of a wooden cask with a spout. The traditional 50 l wooden barrels are only available to our Zappes to masterfully tap and pour at our restaurant.